A foolproof easy dinner all made in one dish, you don't even need to boil the pasta! 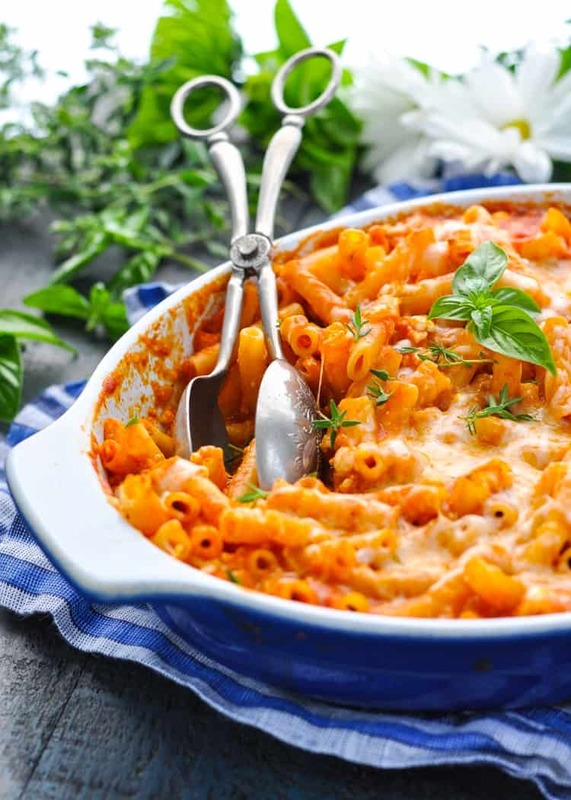 You don’t even have to boil the pasta for this quick and easy Dump-and-Bake 3-Cheese Baked Ziti! Just stir all of the uncooked ingredients together in the dish, cover it with foil, and pop it in the oven. Weeknight dinners just got a whole lot easier! I’m raising a family of pasta lovers! I swear, my husband and my 3 boys could eat some variety of spaghetti, pesto rotelle, or fettuccini Alfredo every single night of the week. But you know what? Baked Ziti has never been on my go-to list…until now. I just always assumed that Baked Ziti was kind of like lasagna — a lot of prep work, multiple steps involved, and a ton of dirty dishes at the end. WRONG! At least, not with my dump-and-bake version! 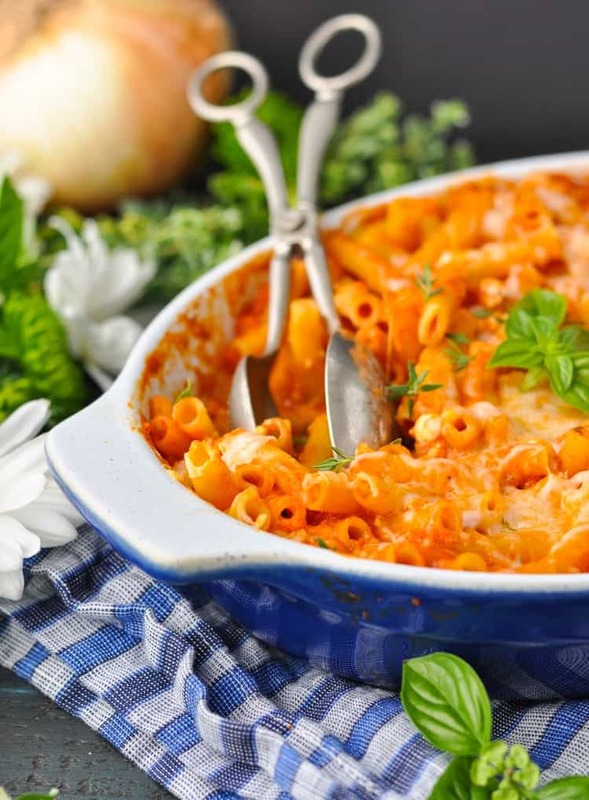 When I decided that I wanted to create a quick-prep twist on the classic 3-Cheese Baked Ziti, I knew that I was stepping out of my comfort zone. I wasn’t sure how the cheese mixture would set up in the oven as the pasta baked in the marinara sauce, and I was fully prepared to trash the final product and try again if it wasn’t an initial success. I’m happy to report, however, that I have apparently become a Dump-and-Bake Dinner Pro. Is that a “thing?” Because if it’s a “thing,” then I’m definitely one of them. 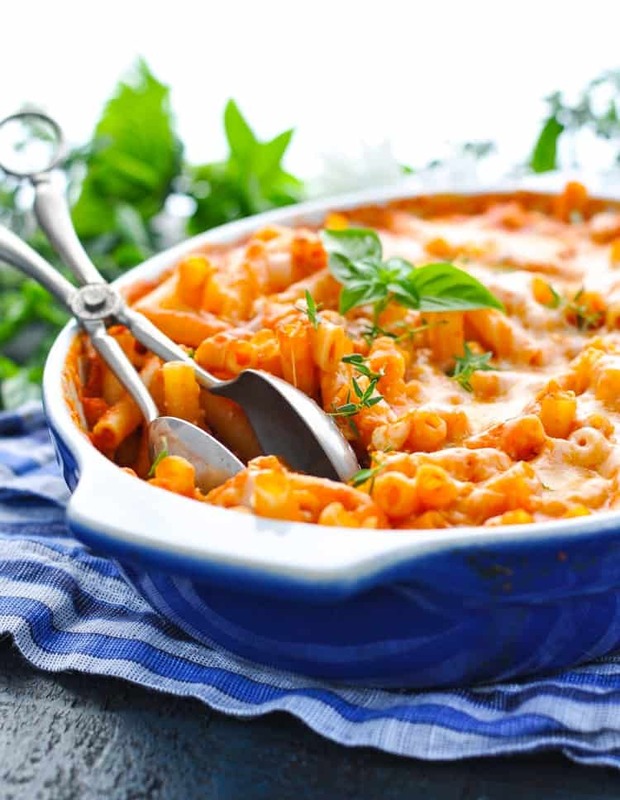 I just can’t get enough of these ultra-easy meals that cook in one dish without any pre-boiling the pasta, washing pots and pans, or slaving over a hot stove. You might just call me lazy? Or busy? Yes and yes! This hearty, soul-satisfying vegetarian one-dish meal comes together in a matter of minutes and my job is done! It’s delicious served with a green salad and some garlic bread if you have the time or desire, but it’s certainly not necessary. 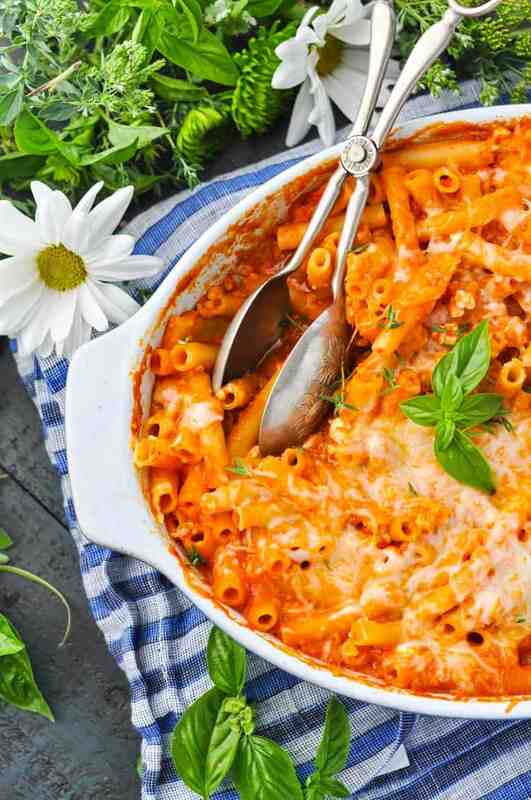 This Dump-and-Bake 3-Cheese Baked Ziti is a new way to prepare an old favorite — and there’s no going back to the original once you’ve had a taste! You can cut all of the ingredients in half and prepare one smaller casserole. Just bake in an 8-inch square pan. The cooking instructions remain the same. Preheat oven to 425F (220C). Spray a large baking dish (about 9 x 13-inches) with cooking spray. 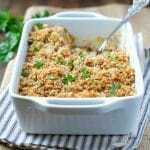 In a small bowl, stir together cottage cheese, Parmesan cheese, egg, parsley, salt, garlic powder, and pepper. Set aside. In a separate bowl, stir together uncooked ziti, marinara sauce, and water. Ladle half of the ziti mixture into the bottom of the prepared baking dish. Pour cottage cheese mixture over the pasta in an even layer. Top with remaining pasta and sauce mixture. Cover tightly with aluminum foil and bake for 40 minutes. Uncover and stir gently. At this point you should check the pasta to make sure that it is al dente (firm but just about finished cooking). If it’s still too hard, cover the dish and return to the oven until pasta is al dente. Then move on to the next step. Cooking Just for Two? 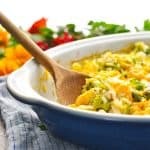 You can cut all of the ingredients in half and prepare one smaller casserole. Just bake in an 8-inch square pan. The cooking instructions remain the same. 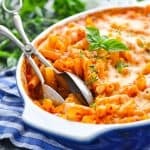 I made baked ziti a few months back, but this version is even easier! Love your dump-and-bake recipes, Blair! You can’t beat comfort food like this, especially when the weather gets cooler! I love your version of baked ziti! So much quicker to getting the pan in the oven. Oh Blair, this sounds super easy & yummy, so I’ll be making it tonight. I always use whole grain pasta(s) & low fat (2%) dairy products, so I’ll use what I have on hand. That being said, I’m sure that the flavor of this dish will not be compromised in any way. I plan to serve this with a huge tossed green salad. 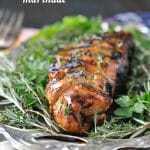 I love easy (yet tasty) recipes on a busy day, and this dish surely fits the bill. Thanks, Blair! Can you use ricotta in place of the cottage cheese? Thanks! Hi, Marsha! Yes — you can absolutely use an equal amount of ricotta! This was fantastic. So easy and good. I don’t think I’ll ever make ziti the traditional way again. I might even try adding some cooked ground beef, sausage or chicken the next time. We got 10 servings from the recipe. I’m freezing leftovers in single portion sizes for easy lunches to take to work. Thank you Blair! Yay! I’m so glad that you liked it, Holly! 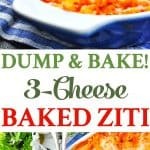 I agree — I doubt I’ll ever make ziti another way again. And yes — adding some meat would work well, too! I’ve been making this yummy stuff for a few years. I use ricotta cheese, but that’s not a big difference. 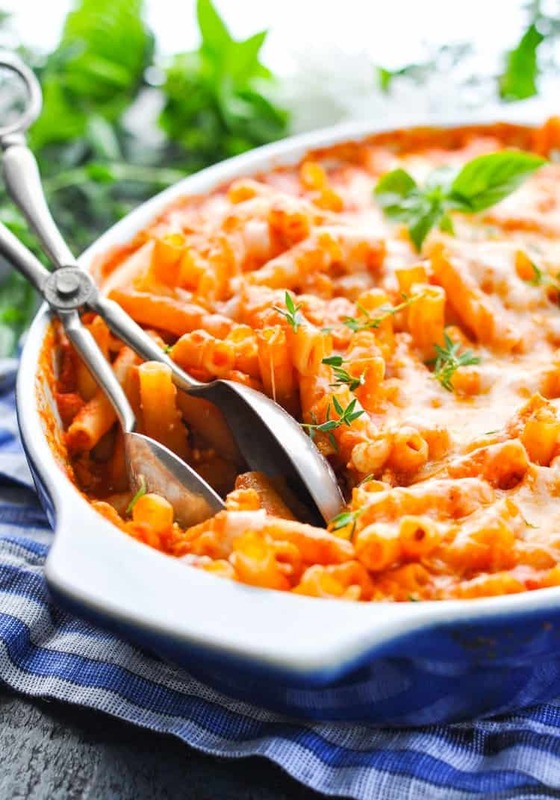 One of the things I love about this is that, since it’s to much food for us, I can mix everything but the pasta, divide it, dump half back into the cheese tub and freeze for another day’s super easy dinner. Can you add 1 lb cooked ground pork/sausage to this recipe. If so where in recipe? 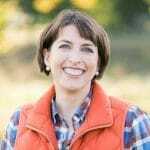 Hi, Betty Anne! Yes! I think that would be a great addition. I would spread the cooked meat in an even layer on top of the cottage cheese mixture (just before adding that second layer of remaining pasta and sauce mixture). Enjoy! Can I mix this and then bake it tomorrow night? I am taking to a family for dinner and want to mix it tonight but didn’t know if I should bake it tonight and then they would reheat it, or if I can still make it up and then they bake tomorrow night. 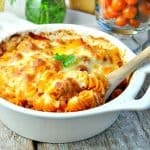 I LOVE baked pasta and I can’t wait to try this especially since I don’t have to boil the pasta first! It’s the easiest way to cook! 🙂 Thanks, Emily! I made your recipe with brown rice pasta and it came out great ! I’ve been simmering the sauce in the crockpot for several hours. Should I cool that down before dumping into the uncooked pasta? I wouldn’t worry about cooling down the sauce too much first. Since it’s already hot, you might just need to decrease the baking time by a few minutes. Keep an eye on your pasta towards the end and just pull it out of the oven when it’s tender. Enjoy! Hi there! Looks delicious. Is there a way to make this dairy free? Any substitutes you know of? This looks great. I should give my son some protein so was wondering if you ever add Italian sausage links in with the sauce to cook with everything? Also, ever cooked a dump dish lower and slower? Hi, Cynthia! I haven’t tried adding the Italian sausage. If I was going to use sausage, I would brown it in a skillet first, and then add it to the baked ziti. Otherwise you won’t be able to drain the oil drippings from the meat as it cooks, which could leave your Ziti greasy. 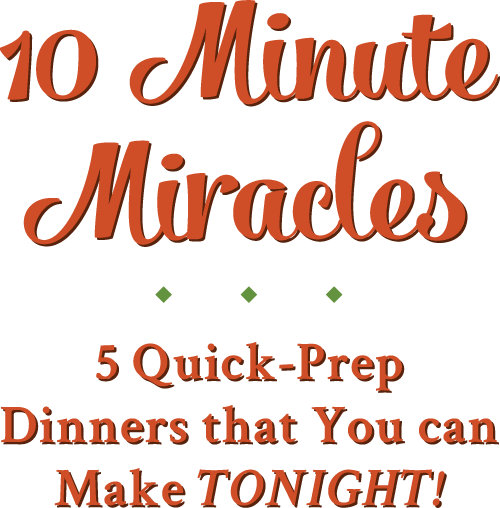 I haven’t tested this recipe in a slow cooker, so I can’t give you a specific cooking time. It would probably work just fine, so long as you can keep an eye on it to make sure that the pasta doesn’t get overcooked and mushy. Thanks for the tips! I couldn’t wait to make it since I had the ingredients and was super busy. I added a bit more cheese as this was no meat and used ricotta, which I had. It was fantastic!! It is gone…whole casserole dish worth! This Dump & Bake recipe is a genuine keeper!. 😃 Can’t wait to read more of your recipes. Very delicious and so easy to make. A little trick I like to do in recipes like this that call for both pasta sauce and some water (so you can cook the noodles), I like to add the water to the pasta sauce jar, put the lid on and shake it to get ALL of that pasta sauce. Then add it to the recipe. This dish comes together quickly and easily. The oven does all the work and I love it! These recipes are perfect when you’re just too tired to cook dinner and a heck of a lot better than turning to fast food. Better for you, and tastes better. I served it with a simple green salad to round out the meal. So yummy! Thank you again Blair, for yet another wonderful meal! PS. For whatever reason, it won’t let me click on the stars for rating, but know that I give it a million stars! Thanks so much, Christine! I love the tip to shake the sauce and water together in the jar! I was interested in making 1/2 the baked ziti recipe, but how do you do 1/2 of an egg? Will a whole egg be too much for half the recipe? Hi throwing this together for my family while I am at work this evening, I don’t trust them to uncover and stir. How do I alter this if I cook the noodles first? Hey, April! I would try just omitting the water called for in the recipe. If you’re using pre-cooked pasta, it will not absorb the water like the dry pasta does. Hope that helps!